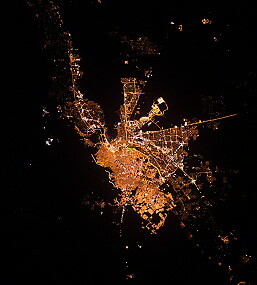 Given names: Koichi Mikhail Vladislavovich Richard Alan "Rick" Aleksandr Aleksandrovich Jr. Oleg Germanovich Steven Ray "Swanny"
Given names: Alexander Maksim Viktorovich Gregory Reid Aleksandr Mikhailovich Yelena Olegovna Barry Eugene "Butch"
Launch from the Baikonur Cosmodrome (Aleksandr Skvortsov, Oleg Artemyev and Steven Swanson with Soyuz TMA-12M). 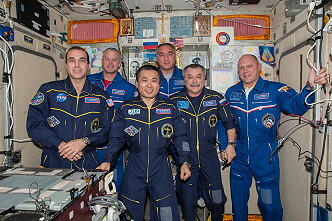 Mikhail Tyurin, Richard Mastracchio and Koichi Wakata were onboard since November 07, 2013 (arrival with Soyuz TMA-11M). 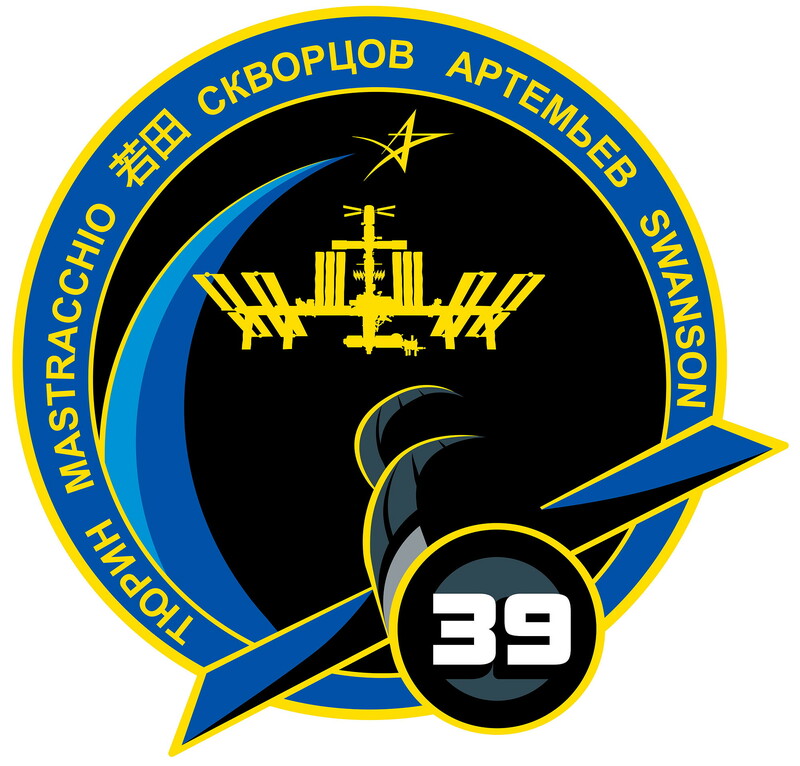 ISS Expedition 39 began with the undocking of spacecraft Soyuz TMA-10M on March 11, 2014 at 00:02 UTC. 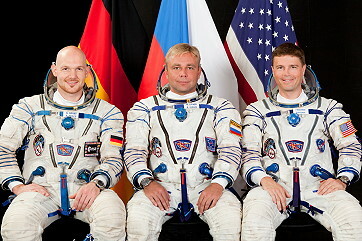 The former Expedition 38 (Oleg Kotov, Sergei Ryazansky and Michael Hopkins) returned safely to Earth. With the arrival of Soyuz TMA-12M on March 27, 2014 the Expedition 39 became a six-person-crew. 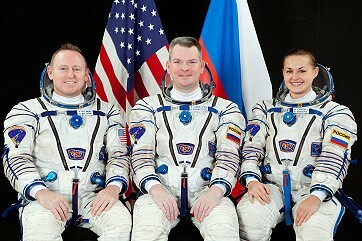 Soyuz TMA-12M carried Aleksandr Skvortsov, Oleg Artemyev and Steven Swanson to the space station. Soyuz TMA-12M, kicking off a planned four-orbit, six-hour rendezvous with the station. They executed the first two rendezvous firings on schedule, but the third firing was not carried out, possibly because the spacecraft was not in the expected attitude, or orientation. With the rendezvous sequence interrupted, Russian flight controllers defaulted to the more traditional two-day sequence. Progress M-22M undocked from the ISS on April 07, 2014 at 13:58 UTC. Progress remained in orbit for the non-ISS-related "Radar-Progress" experiment. The freighter was de-orbited on April 18, 2014 over the South Pacific. 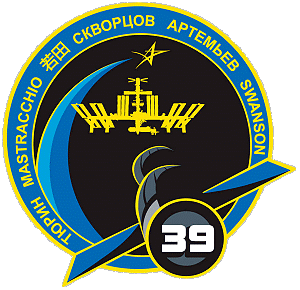 Progress M-23M was launched on April 09, 2014 at 15:26:27 UTC from the Baikonur Cosmodrome in Kazakhstan. The unmanned freighter docked with the Pirs docking compartment on April 09, 2014 at 21:14:18 UTC, less than six hours after launch. The Progress spacecraft carried 2686 kg of cargo, including 1,764 pounds (800 kg) of propellant to be pumped inside the Russian Zvezda service module, 105 pounds (48 kg) of oxygen and air to replenish the atmosphere inside the space station, 926 pounds (420 kg) of water, and 3,126 pounds (1,418 kg) of supplies and experiment hardware, including fresh food, medical supplies, electronic equipment and other gear to the International Space Station. A Dragon cargo craft (CRS-3 or SpX-3) stuffed with science and supplies approached the International Space Station for an automated laser-guided final rendezvous April 20, 2014, culminating with grapple by the outpost's robotic arm. Owned by SpaceX, the Dragon spacecraft completed a 40-hour trip from launch to the international research complex at 11:14 UTC, when space station commander Koichi Wakata guided the lab's robot arm to grapple the free-flying cargo capsule. Dragon was berthed to the Harmony module at 14:06 UTC. 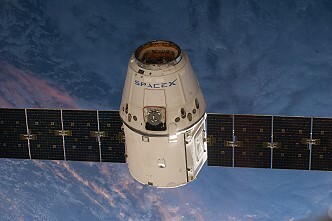 SpaceX delivered 4,600 pounds (2,087 kg) of supplies, logistics and experiments aboard the Dragon spacecraft. The space station's astronauts will manually unpack the 3,347 pounds (1,518 kg) of gear stowed in Dragon's internal module, while the outpost's Canadian-built robotics systems will remove two payloads mounted inside Dragon's trunk. The Dragon spacecraft blasted off April 18, 2014 at 19:25:22 UTC on top of a Falcon 9 rocket from Cape Canaveral Air Force Station, Florida. The Dragon supply ship reached the space station after a series of engine burns to fine-tune its course toward the 450-ton orbiting complex. The Progress M-21M resupply craft separated from the International Space Station at 08:58:20 UTC on April 23, 2014 and completed its first engine fire to move it a safe distance away. Progress M-21M rendezvoused with a new system, known as Kurs-NA. Kurs-NA uses only a single antenna, allowing four others to be removed, leaving only three or half as many as current versions of the spacecraft. Kurs-NA also will use less power, improve safety and possess updated electronics. 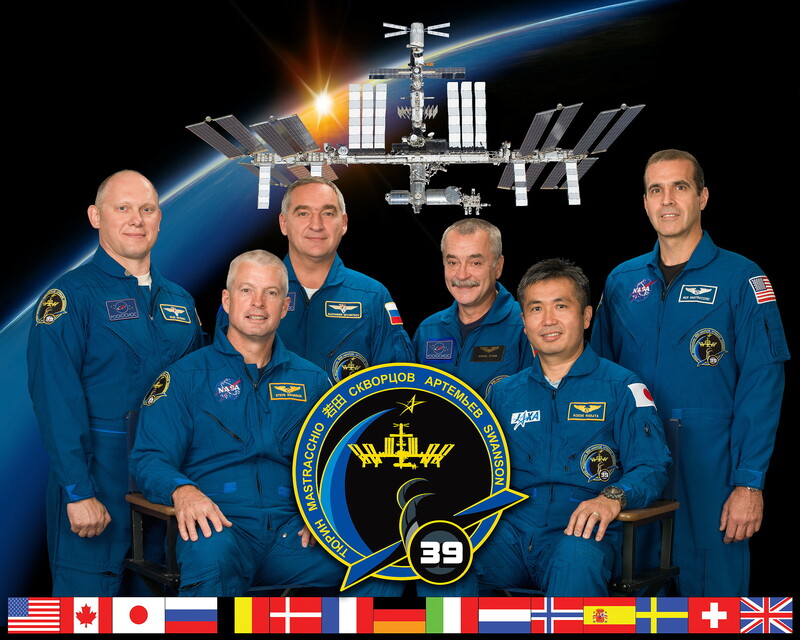 The re-docking occurred on April 25, 2014 at 12:13:11 UTC with the Zvezda module. Two previous tests of the Kurs-NA systems had failed in July 2012 and November 2013. 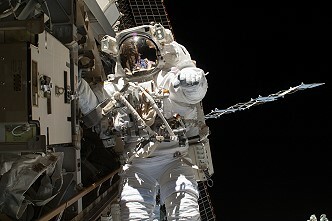 On April 23, 2014 an EVA by Richard Mastracchio and Steven Swanson (1h 36m) was needed. The astronauts replaced a backup multiplexer-demultiplexer (MDM) that failed during routine testing April 11, 2014. 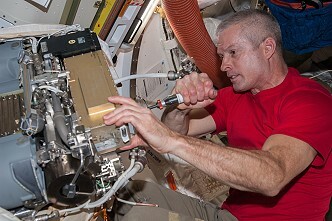 The box is one of the station's two external MDMs that provide commands to some of the space station's systems, including the external cooling system, solar alpha rotary joints (SARJ) and mobile transporter rail car. The multiplexer-demultiplexer (MDM) is 27 x 42 centimeters in diameter and has a mass of 23 kilograms. High definition camera equipment, growing plants in space, and a variety of physical science, biology and biotechnology experiments define the research of Expedition 39. Other investigations include human research, technology demonstrations and educational activities. Expedition 39 activities will continue to advance our body of scientific knowledge, provide a platform for Earth and astronomical observation, educate and inspire younger generations and prepare future crews for deep space exploration beyond low-Earth orbit. Vegetable Production System (Veggie): Veggie is a plant growth facility capable of producing salad-type crops to provide the crew with appetizing, nutritious and safe fresh food and supporting crew relaxation and recreation. 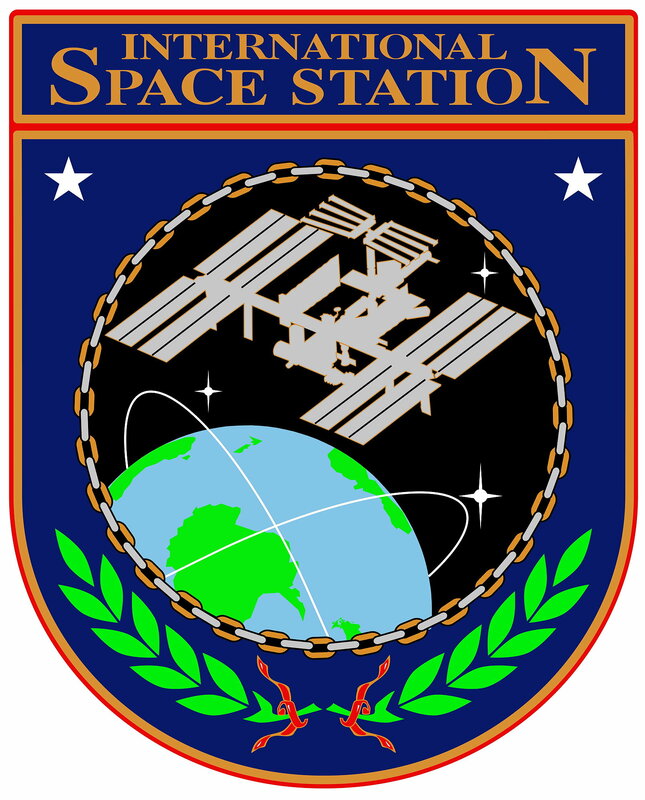 The Veggie unit provides lighting and nutrient delivery, but uses the cabin environment on the space station for temperature control and as a source of carbon dioxide to promote growth. 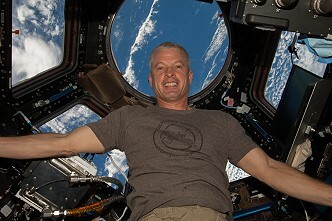 This study will emphasize the focus on human habitability in space, since growing food in microgravity may improve long-duration spaceflight. Veggie can support a variety of studies used to determine how plants sense and respond to gravity. Astronauts will harvest the plants for further investigation. With continued plant growth studies aboard the space station using facilities like Veggie, crews may one day consume produce during long-term missions in low-Earth orbit or to an asteroid or Mars. The Veggie unit's growth volume will be the largest volume available to date for plant growth on the space station, which will enable larger produce than was previously available, due to size restrictions. This improved understanding of plant growth and development in microgravity has important implications for improving plant growth and biomass production on Earth. Advanced Colloids Experiment-Microscopy-2 (ACE-M-2): ACE-M-2 examines the behavior of liquids and gases near the critical point, or the point at which there is no distinct boundary between the liquid and gas phases. ACE-M-2 uses a new microscope to record micro-scale events on short time scales; previous experiments observed large-scale behavior over many weeks. Liquids and gases of the same material usually have different densities, so they would behave differently under the influence of gravity, making the microgravity environment of the International Space Station ideal for these experiments. Particle separation and behavior in liquids, gels and creams is important for developing consumer and household products on Earth. The ACE investigations on the space station provide insight into product formulations that could be used to maximize stability and shelf life. 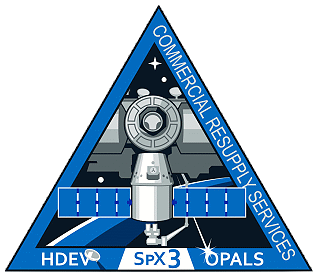 High Definition Earth Viewing (HDEV): The HDEV investigation places four commercially available high definition cameras on the exterior of the space station for use in streaming live video of Earth for online viewing. The cameras are enclosed in a temperature-specific case and exposed to the harsh radiation of the space environ-ment. Analysis of the effect of space on the video quality during the HDEV operational period may help engineers determine the best types of commercially available cameras to use on future missions. Using available products may be more cost-effective than designing new products. High school students helped design some of the cameras' components, through the High Schools United with NASA to Create Hardware program, and student teams will operate the experiment. Image can be seen in a live stream at http://eol.jsc.nasa.gov/HDEV. MicroRNA Expression Profiles in Cultured Human Fibroblasts in Space (Micro-7): The majority of cells in the human body are non-dividing cells that provide critical functions, from blood cells to cells in different organs. Micro-7 studies how microgravity affects the genetic expression and physical shape of these types of cells for the first time. Understanding how these cells function in microgravity is a step toward understanding how organs, tissues and the entire body change during spaceflight. Researchers can use data from Micro-7 in future Earth-based studies to examine whether the cell changes observed during spaceflight are seen in disease states of tissues and organs as well. Ultimately, this may help scientists better understand disease. This type of research could lead to developing new drug treatments. Finally the station command changed from Japanese astronaut Koichi Wakata to US astronaut Steven Swanson. With undocking of Soyuz TMA-11M, carrying Mikhail Tyurin, Richard Mastracchio and Koichi Wakata the Expedition 39 concluded and the new ISS Expedition 40 began.